if you missed them part one is here and part two is here. "The first missionaries to arrive in Hawaii were a group of Americans, who sailed aboard a ship called the Thaddeus and arrived on March 30, 1820. Among them were Hiram Bingham, his wife Sybil, and Asa and Lucy Thurston. They’d been sent by the American Board of Commissioners for Foreign Missions headquartered in New England. The missionaries brought a staunch New England Protestantism to the islands as well as instilling market values and trying to change indigenous Hawaiian society to what they thought was a more acceptable “Christian” way of life. 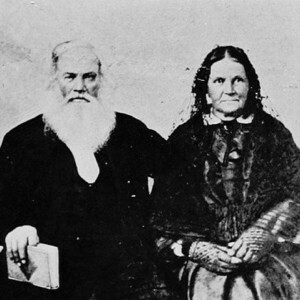 The Binghams in particular were highly critical of traditional Hawaiian ways, but despite this, they became friends with the ruling families of Hawaii, some of whom began to convert to Christianity in the 1820s and 1830s. Bingham founded the Kawaiaha’o Church in Honolulu in 1836, at which Hawaiian kings, including Kamehameha III, worshiped. It’s today regarded as sort of the “St. Peter’s Basilica” of Hawaii (minus the Catholic connotations, of course)." "More missionaries quickly followed the Thaddeus group… After their deaths their descendants formed the cultural and political elite of Hawaii–at least among white Hawaiians, of whom there were very few in the early years." "The earliest eye-witness accounts written about the portion of Hāmākua in which Laupāhoehoe Nui is situated, were recorded by English Missionary, William Ellis. 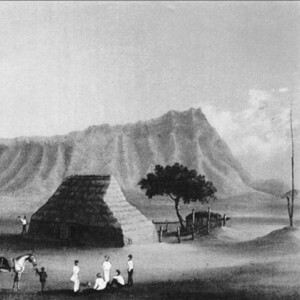 In August 1823, he visited the valleys of the Hāmākua and North Kohala Districts. The primary motive of the journey was to seek out the best locations for the establishment of missions and schools. These generally came to be situated in the areas with the largest populations in a given region—in northern Hāmākua, churches and schools were established in Waipiʻo and Waimanu valleys." "Continuing the journey along the coast, Ellis described the lands passed while paddling to the Kohala valley lands:"
"We landed at Honokane, and went through the village to the house of Ihikaina, chief woman of the place, and sister to Arapai, the chief of Waimanu, from which this district is distant about twenty miles. Ihikaina received us kindly, and for our refreshment provided a duck, some vegetables, and a small quantity of excellent goats milk, large flocks of which are reared by some of the natives for the supply of ships touching at the islands for refreshments." "The valley contained fifty houses. A number of the people collected round the door of the house, and listened to a short address." "About 4 p.m. we left Honokane, and passed on to Pololu. On our way we walked over a long tract of fragments of rocks, occasioned by the falling down of a side of the mountain, which took place at the same time that the mass of rocks fell at Laupahoehoe, which we had passed in the forenoon." "It was impossible, without considerable emotion, to walk over these rocks; some of them were broken in small pieces, others in blocks of several tons weight, each lying exactly as it had fallen, the fractures fresh, and the surface hardly discoloured, while the steep side of the mountain from which they had fallen looked as smooth and even as if the mass below had been separated from it only a few minutes before." "In some places between Honokane and Pololu, we had to walk in the sea, where the water was up to the knees, but by watching the surf we passed by without much inconvenience." "Pololu is a pleasant village, situated in a small cultivated valley, having a fine stream of water flowing down its centre, while lofty mountains rise on either side." "The houses stand principally on the beach, but as we did not see many of the inhabitants, we passed on, ascended the steep mountain on the north side, and kept on our way. The country was fertile, and seemed populous, though the houses were scattered, and more than three or four seldom appeared together. The streams of water were frequent, and a large quantity of ground was cultivated on their banks, and in the vicinity..."
"Later, while traveling across land to the South Kohala-Waimea region, Ellis and party again encountered people returning from the mountains, with loads of ʻili-ahi. He observed:"
"Before daylight on the 22d we were roused by vast multitudes of people passing through the district from Waimea with sandal wood, which had been cut in the adjacent mountains for Karaimoku, by the people of Waimea, and which the people of Kohala, as far as the north point, had been ordered to bring down to his storehouse on the beach, for the purpose of its being shipped to Oahu." "There were between two and three thousand men, carrying each from one to six pieces of sandal wood, according to their size and weight. It was generally tied on their backs by bands made of ti leaves, passed over the shoulders and under the arms, and fastened across their breast. When they had deposited the wood at the storehouse, they departed to their respective homes." this was the first major bridge i had come across… basically 85-90 degree walls overtop of an approximately 30m [100'] deep canyon at the point where the bridge crossed. nope, no easy access that i saw to the bottom of the honopu'e valley that day. i had decided not to take any ropes and given the extent of things, likely would have needed a harness as well. that said, it wasn't until i watched the clips while putting this together that i was reminded of how nervous i was to first cross that bridge... i had forgotten that i had actually decided to turn around and shut the camera off, the first time i went to cross the bridge, as i remain preferential to not leaving any snuff flicks in my wake. once i did make it across, i turned the camera back on for a return crossing, so that i could capture a tiny portion of the experience. as it had held firm, i traversed back up the opposing side's incut trail as it moved past more access ports to abandoned kohala ditch tunnels and walked over the beginnings to a couple of the waterfalls that i had seen from the other side. K. The Great Māhele + Smallpox [Again]: What are the foundations of the common Hawaiian being dispossessed from their land + the primary cause for their population being reduced from about 300 000 down to 60 000, Alex? Land distribution after the Great Mahaele. "The idea of owning the āina (land) was hard for Hawaiians to grasp. In Hawaiian culture no individual owned land - it belonged to the akua (gods). The mō’ī (king) and his ali’i nui (high chiefs) controlled the land while the konohiki (lesser chiefs) managed it. The maka’āinana [a class of the common people] lived on and cared for the land. In return they gave the ali’i nui their service and a portion of what they produced. Hawaiians believed the land gave them everything they needed to sustain life." "On January 27, 1848, the Māhele, or division of lands, began. With the Māhele, the foreign concept of "land ownership" was established in Hawaii. The traditional relationship Hawaiians had held with their āina would never be the same." "The Land Commission had determined that the land should be divided into equal thirds. One third would go to the ali’i, one third would go to the government and the final third would go to the maka’āinana." "It did not take long for the aliens, or foreigners, to get what they wanted. The Resident Alien Act of July 10, 1850, gave them the right to buy land in fee simple. Fee simple means that land is owned rather than leased. It also means that individuals who own land may sell that land or pass it on to their heirs. This is the system the foreigners understood and wanted for Hawaii." "The maka’āinana had to follow certain steps before they could own their land. First, they had to have their kuleana surveyed, or measured for size and boundaries. Then they had to present their claims to the Land Commission, showing that the land was cultivated to earn a living and that they had a right to those kuleana. They also needed to file their claim by 1854." "Unfortunately many maka’āinana did not do what the law required. They lacked the knowledge, experience and money to pay for surveys. In addition many missed the 1854 filing deadline. Only 13,514 claims were filed and the number of kuleana grants actually awarded was just 9,337. Maka’āinana ended up with less than 1 percent of the total land available." "The native population succumbed to disease brought by the Europeans (particularly smallpox), declining from 300,000 in the 1770s, [down to about] 60,000 in the 1850s to 24,000 in 1920." there was however a pencil and a small piece of paper, inside... i don't recall there being anything written on it, but figured i'd add my name. due to a picture perfect viewpoint offering picnic table, i took the opportunity to stop and eat while soaking in the view. and oddly enough for the first time, there was some cell coverage here as well. so i sent a quick update to let family know i was switching plans and was going to continue to follow the kdt as long as i could, rather than head out to the coast. 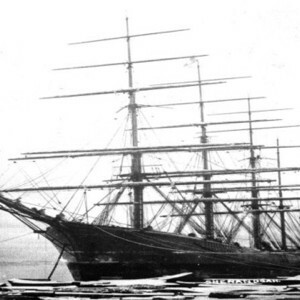 "The CSS Shenandoah was 230 feet long, had a thirty-two foot beam, carried three rigged masts and was equipped with steam power. Sleek and swift, she could make sixteen knots under sail and nine knots with her 150-horsepower engines. Armaments included two 32-pound and two 12-pound cannon, both rifled for accuracy, deadly against virtually unarmed whalers. Her Captain was James I. Waddell, formerly a Lieutenant in the U.S. Navy with over twenty years experience. Waddell's exact orders were:"
"On March 30, 1865, the Shenandoah came across the Hawaiian-based trading schooner Pfiel on the open seas and learned of the presence of American whalers at Pohnpei in the Caroline Islands, known then as Ascension. Under full sail and steam, CSS Shenandoah raced to the Pohnpei island and on April 1, 1865, caught four whalers in port at Pohnahtik, Madolenihmw. "As the Shenandoah slid into the harbor, the whalers raised their flags in her honor." The raider flew no flag so they had no idea of her disposition until it was too late [...]"
"Waddell finally accepted that war was over August 2, 1865, after being so informed by a British ship's captain. He surrendered his ship to British forces in Liverpool, England on November 6. 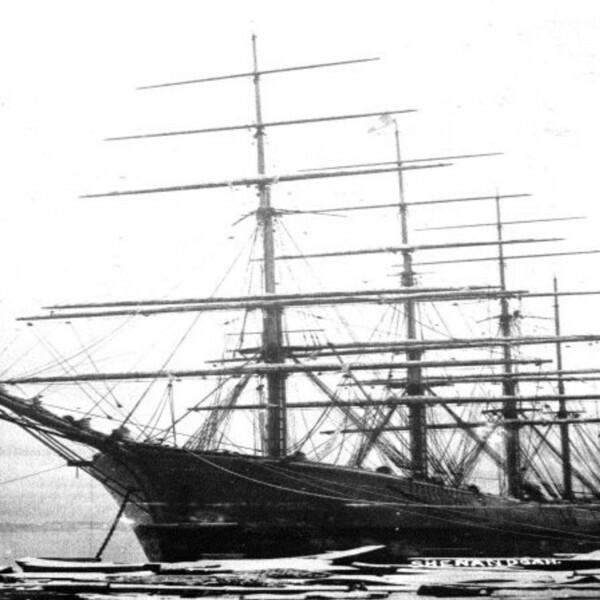 In all, the Shenandoah captured thirty-eight vessels in 1864 and 1865." "The whalers that the Shenandoah sank translated into fewer ships to do business at their Pacific ports in Honolulu or Lahaina. There were fewer purchasers for supplies, hundreds fewer sailors to spend their wages, and a reduction in the commissions for Honolulu businessmen in the transshipment of oil. Honolulu merchants were unable to move goods on their shelves and shipments were delayed as the city's business climate darkened. The island economy was flooded with out-of-work sailors from the sunken ships." "The blow to the whaling industry both in New England and Hawaii helped contribute to the economic transition that was occurring in the Kingdom of Hawaii as its main industry shifted from whaling trade to sugar plantations." "... the reasons for the sugar industry's growth in Hawaii during the war are well documented. The war created high market prices, as Southern grown sugar was no longer available to the markets of the Northern states. Morgan reports "Prices in the North rose extravagantly due to cutting off of the supply of Louisiana sugars and inflation of currency" and the amount paid for exports rose from less than seven cents per pound in 1859 to over seventeen cents per pound in 1864.86 It should be conceded, however, that "the high prices were partially offset by higher tariff rates imposed [by the U.S.] to meet war costs." Nevertheless, the industry enjoyed rapid expansion through 1866." "The Hawaiian sugar industry was born out of the American Civil War. 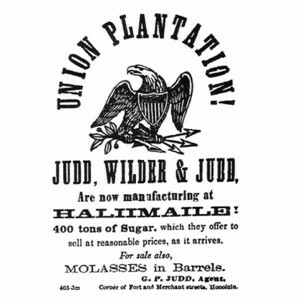 One plantation made the connection between Hawaiian sugar and the war clear in their name "Union Plantation" and logo, the American Eagle clutching olive branch and arrows." while this section of the trail was more overgrown than the section between waipahi gulch and the honopu'e valley, still it was surprisingly good. except for the false start from the cabin at the crest of the honopu’e valley, i don't recall any significant periods of losing the trail... that said there were at least a few times, where i'd have to double back a few feet after making the wrong choice at what appeared to be a "y" intersection, but was probably just a split in the pig's network of trails. that was also because in this section, for every marked stream on the map there must have been another three or four that are unnamed. while i didn't keep count i must have crossed at least a few dozen streams of varying size on this adventure. and so this part of the trip, even after reviewing the video that i took, remains a bit dreamlike to me. moving in and out of dozens of streams while never seeing the ocean or other significant landmark meant that exactly where i was at, or even specific memories fade into a collective sense of the experience as a whole rather than of any one place in particular. that is with one exception. the one exception, that definitely did imprint itself on my memory, was of the bridge that i'm assuming must have been across ohiahuea stream. while i don't know for sure if that is where it was at, what i do know is that the supports holding up the planked bottom were no longer structurally sound [they were rusted out, yo], so i crossed over the forty foot or so deep ravine by putting my feet on the two lower chains that were supposed to act as guards while i used the upper two chains for my hands… in this fashion i slowly made my way across, after first doing a little bounce testing on the remaining structure. "The economy changed rapidly during the Meiji Period because the government realized they needed to become more modernized in order to compete against Western nations. The government became involved in changing many sectors of Japan including: agriculture, industry, trade, banking, and taxation. These reforms abruptly occurred during the Meiji Period (1868-1912)." "[Farmers] were allowed to move freely and sell their products anywhere, [but this change came with] a 3% land tax imposed on the farmers. In the Edo period, taxes were paid in crops such as rice, but now were paid in money. Taxes were calculated as a proportion of the cash value of the land rather than the actual crop yield. The landowner confirmed by the issuance of land bonds, was liable for the taxes instead of the farmer. 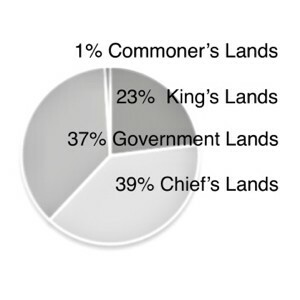 The land tax caused many riots. In a result to resolve this, tax was lowered to 2.5% instead of 3%. Many farmers had their land confiscated due to inability to pay taxes. By the end of the Meiji Period 67% of peasant families were forced to tenancy. Agriculture was dominated by a tenant farming system. Families were often driven to pay over half their crops as rent. In an attempt to pay taxes, relatives were strongly influenced to send their wives and daughters to textile mills. Many families had a difficult time making ends meet; to make extra money, daughters were forced into prostitution. 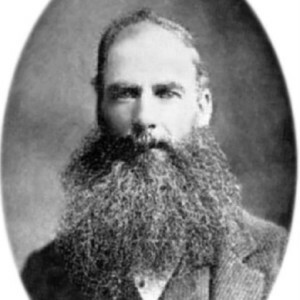 The circumstance went downhill when the deflationary Matsukata Fiscal policy developed in 1881-1885. This policy economically [depressed] rice prices which lead to bankruptcies and rural uprisings against the government." "The first Japanese immigrants to Hawaii, known as the gannen mono (first-year arrivals), arrived in 1868. The Hawaiian Kingdom's Board of Immigration had asked Eugene Van Reed, an American merchant who had served as the Hawaiian consul in Japan, to recruit contract laborers to work in the cane fields. 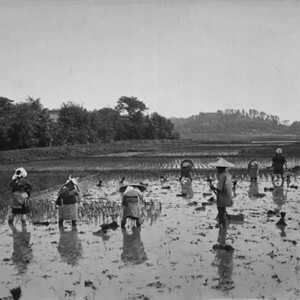 Van Reed recommended the Japanese as excellent laborers and spoke in the highest terms of their industry and docility, their cleanliness and honesty, and their adaptability." "It proved difficult to gather the anticipated number of 350 immigrants, and in the end only 148 (of these 6 were women) were actually recruited. Their pay was to be $4 per month with room and board provided for a three-year period, and Hawaii covered their round-trip ship passage. Many of the gannen mono were gamblers and idlers recruited from the streets of Yokohama who knew nothing about farming and were ill-suited for hard work in the sugarcane fields. When misunderstandings arose about their pay, this first effort at bringing in Japanese labor ended in failure. No additional contract workers came from Japan for another decade and a half." "The Japanese government signed a formal immigration agreement with the kingdom of Hawaii in 1885. During the next nine years, nearly thirty thousand Japanese crossed the ocean to work under three-year contracts for wages of $12.50 per month. Most were poor tenant farmers from the bottom economic strata in Japan. 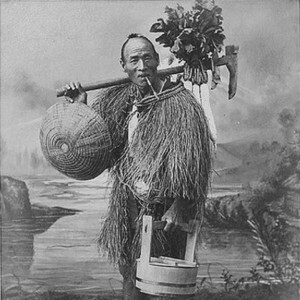 Unlike the gannen mono, these Japanese contract workers were accustomed to working in the fields. Seeing that the Japanese worked as strenuously as the Chinese, the plantation owners soon competed to hire them. (Plantation managers ordered the procurement of "Japs" in the same memoranda in which they ordered macaroni, rice, horses, and mules.)" "The Japanese government backed the contract labor system as a way of earning foreign exchange. It declared, "If we send 3 million workers out into the world and each one of them sends back to Japan $6 per year, the country will benefit." In fact, money remitted by the immigrants to Japan during the Meiji period amounted to more than 2 million yen annually. For a Japan struggling under foreign debts incurred to procure military equipment and other foreign goods, the foreign currency sent home by the immigrants, who hoped to return home "clad in brocade" after enduring hard labor under the broiling Hawaiian sun, was not an insignificant sum." you know, there were a lot of mini heavens along this journey... but the section between ohiahuea stream and the waikaloa stream remains one of my fondest memories. getting to see the lushness of the vegetation and the beauty of the numerous streams, all while experiencing the feeling that one gets when things start to feel truly remote, meant that i felt blessed to be able to move through this part of the trail with the unexpected and relative ease that i had found. and due to all of the remnants of the kohala ditch, be they tunnel access points, dams across streams, or the trail itself, it remained at the forefront of my mind exactly whose hands and hooves i had to be thankful to. part four is now posted here.